Club Penguin Cheats by Mimo777 Club Penguin Cheats by Mimo777: Club Penguin New Igloo Experience Sneak Peek! Club Penguin has uploaded a sneak peek of the new igloo experience coming to the island soon. Whoa! So Cool! We will be able to save up to 3 igloos or even have no igloo at all! AND, we can "like" igloos! Saweet! 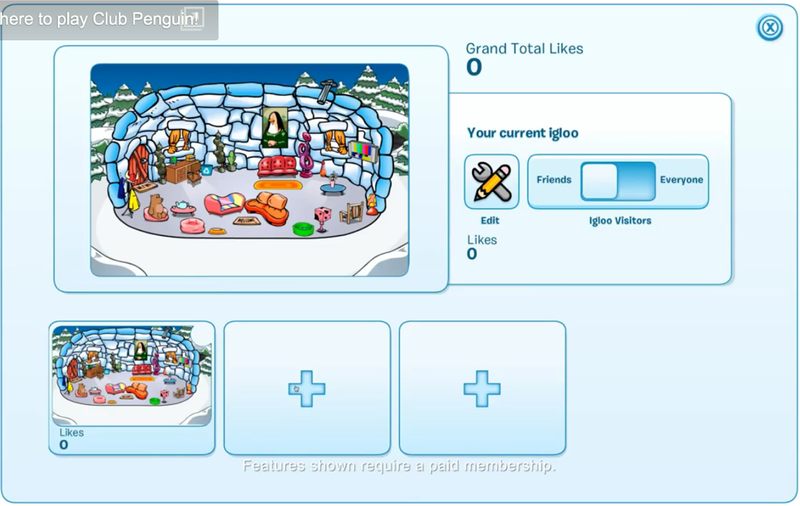 The igloo experience looks similar to the puffle upgrade, doesn't it? Seems interesting. I hope there will be a good amount of different background settings to choose from in the future. I think this update will be pretty cool and beneficial. Beneficial to those who have decent artistic skills anyway. For others it'll just be cool. What do you mean by ''we'', only members or everybody? Starting to sound like Habbos system of rating rooms, but considering Habbo is muted and probably going to be killed, I'm excited. It says "Features shown require paid membership", so that means you need to be a member to be able to do this stuff. It says you can save the flooring! And shows a empty field too. We've been wanting one of those to go camping in. I have been sending emails to CP fanmail for YEARS asking for igloo backgrounds - I'm so happy that they finally decided to add the feature! I'm hoping they will change the player cards soon, I have SO many items and it takes so long just to find my favorites. @Anonymous - The fine print at the start of the video states "Features shown require a paid membership", so I'm assuming it means member only. If nonmembers want to do all the things members do, they need to work like we do and buy a membership. I babysit, my cousin mows lawns in the summer. Why would someone pay if they didn't get anything for it? That's why members get things nonmembers don't. Wow that looks super-duper fudging cool! When are they putting that up. Were still waiting on Arctic White.